YOUR FITNESS NEEDS AND GOALS! 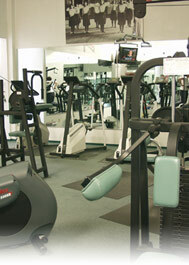 • State-of-the-art equipment that will help you strengthen tone and shape your body. • Friendly staff with great customer service. • Personal trainers who are determined to help you succeed in your fitness goals. • A Juice Bar to replenish vital energy. Combine your fitness program with proper nutrition, regular medical check-ups, and a positive attitude... and enjoy the results. To receive your 7 FREE days of fitness, please print out our coupon. We look forward to seeing you at the club!